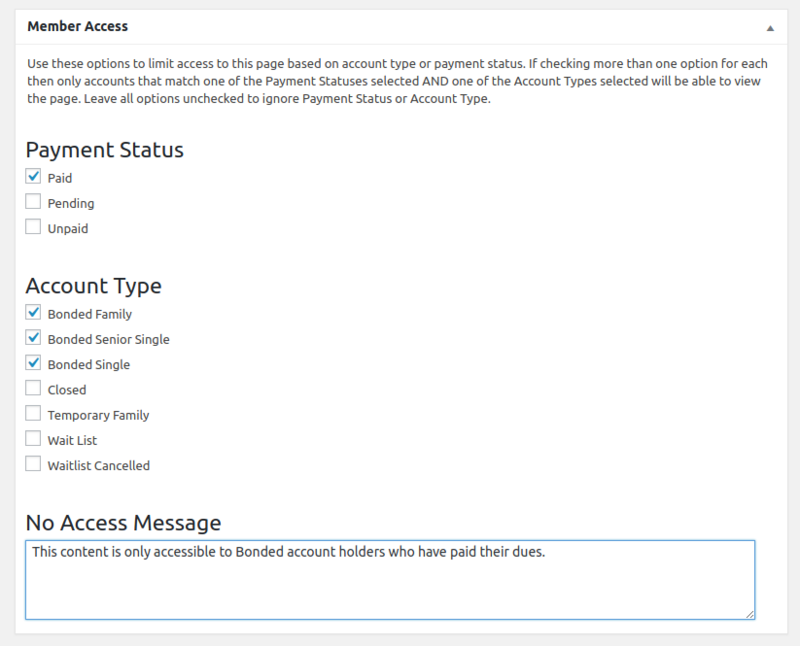 Member Splash provides the ability to restrict access to pages on your site based on account type and/or payment status. A typical use case is clubs that have swimming only memberships and ones that include tennis privileges. You can use the access controls to limit access to court reservations to your tennis privileged accounts. When you add or edit a page you can scroll down to the bottom where you will find a section labeled Member Access. NOTE: If you don’t see it you may need to enable it by clicking on Screen Options at the top of the page and then checking the box next to Member Access. Once you click Screen Options it will expand to display a settings panel like the one below. With that setting enabled you will see the Member Access box with options for restricting content based on payment status and account type. Simply check the box(es) next to each status / type and then click on Save (for a new page) or Update (for an existing page).